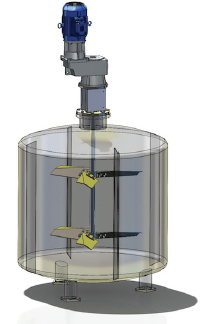 Cleveland Mixer engineers a durable and effective solution for mixing and agitating in IBC tote tanks, whether constructed of plastic or steel. 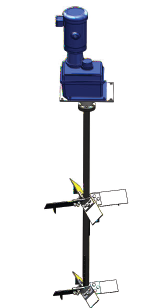 The agitator is self contained and pre-mounted on a rigid steel drive support that traverses the tote tank. 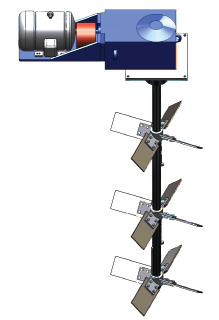 The same agitator can be used on a variety of tote tank volumes and dimensions with our easily adjusted mounting frame. Cap and lid mounted mixers are also available with lifting eyes, lock down clamps and splash guards when required.Read More.. The BHD top entry mixer from Cleveland is de- signed precisely to integrate with your process vessel. Its fabricated, rigid gear reducer casting, mammoth Timken bearings and steel base plate eliminate the risks of excessive vibration, torsional frequency and poor mechanical reliability.Read More.. The CD/CA Series is suitable for smaller batches or OEM applications. They feature large sealed ball bear- ings on the output shaft to absorb side loads. These mixers are recommended for blending in 50 to 500 gallon tanks and applications for moderate shear or blending light liquids. Read More.. The CG/CAG Series is suitable for smaller batches or OEM applications. A heavy duty sealed ball bearing absorbs shaft deflection loads and provides extended mixer service. These mixers are recommended for blending in 50 to 1,000 gallon tanks and applications for moderate flow rates or blending light to medium viscosity liquids. Read More..
Cleveland Mixer engineers a durable and effec- tive solution for mixing and agitating in 55 gallon drums, whether constructed of plastic or steel. 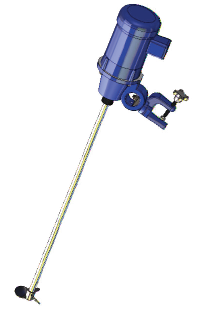 The agitator is self contained and pre-mounted on a rigid steel drive support that traverses the tank. 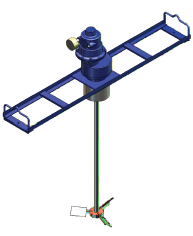 The same agitator can be used on a variety of drum volumes and dimensions with our easily adjusted mounting frame. 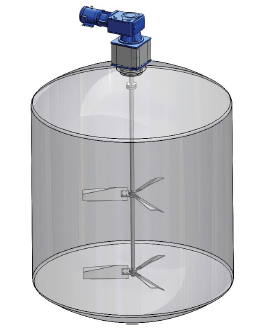 Cap and lid mounted mixers are also available with lifting eyes, lock down clamps and splash guards when required. Read More.. 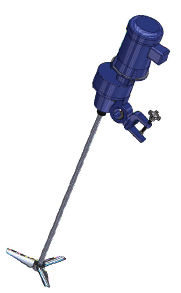 The FRG and FRH model series from Cleveland Mix- er is a venerable and rugged agitator design that is suitable for mixing applications from 500 to 5,000 gallons. The product series is easily adapted across a host of different industrial mixing processes and envi- ronments by virtue of its broad selection of horse- power, output speeds and impeller configurations. Durability is assured through the use of heavy duty, oversized Timken tapered roller bearings, AGMA 10 helical gearing and rigid shaft couplings Read More.. 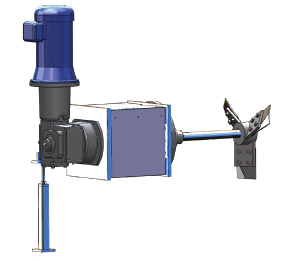 If downtime is not an option, Cleveland Mixer's HGD Parallel Shaft Mixer is the right solution. Ideal for industrial waste treatment, biofuels, chemical and petro-chemical, as well as pulp and paper production, our Parallel Shaft Mixers offer unmatched system rigidity, vibration isolation, and bearing life (over 100,000 hours). With a record of 16 years of continuous uptime and our standard three year warranty, the HGD Series is peace of mind you can purchase. Read More.. The Cleveland Mixer portable agitator series fea- tures class leading durability and strength with a bearing support designed with Timken tapered roller bearings, AGMA 10 helical gearing, virtually unbreakable STEEL c-clamp, and a massive hollow bore low speed coupling. The RG portable mixer series is ideal for applica- tions from 500 gallons to 5,000 gallons, in horse- power ranges from ¼ to 3. Output speeds are 264 or 400 RPM Read More.. The RH/RA Series feature oversized bearings, couplings and a mounting clamp. They feature large sealed ball bearings on the output shaft to absorb the side loads. These mixers are recommended for blending 50 to 1,000 gallon tanks and applications where high shear and moderate flow are required. Read More..
Cleveland Mixer's RXT series top entry mixers are designed with durability at the forefront, and are engineered to meet your most exacting process requirements. RXT gear reducers are produced in an ISO 9000 certified facility. 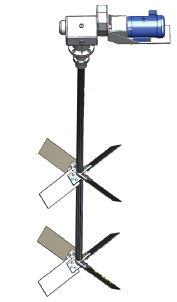 They are drywell equipped, designed and applied for mixer/agitator service. 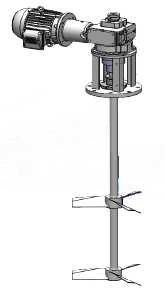 This is evident by use of a 'drop bearing' housing that features oversized bearings to support the impeller shaft and isolate the gearing from hydraulic loading. Read More..
Side-entering mixers work efficiently where a tank is too large for convenient installation of a top-en- tering mixer, or where headroom is severely limit- ed. Side entry mixers are less expensive than top entry mixers in large tank installations because the long shafts required. Read More.. 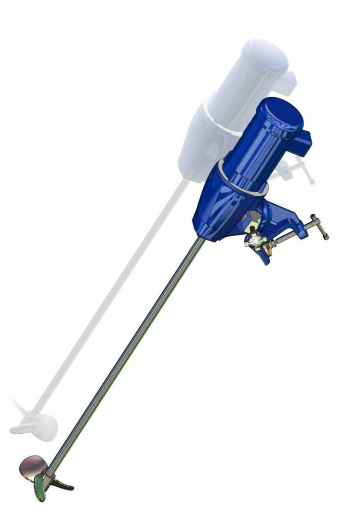 The Cleveland Xtraflo sanitary service mixer features a low profile, right angle, drywell equipped gear reducer that is designed explicitly for agitator service with long overhung impeller shafts and high thrust impellers. Cleveland Mixer has hundreds of installations in food and pharmaceutical plants. 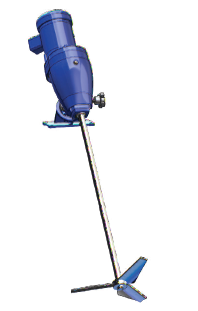 We have designed these mixers to meet or ex- ceed the stringent requirements from the FDA, USDA and BISSC. Read More..